BEIJING - For decades, Tang Yawei's name has been synonymous with stenography in China. In the 1930s he developed a standardized Chinese shorthand method, Yawei Chinese Shorthand, which is now widely used, especially by journalists and professional stenos. 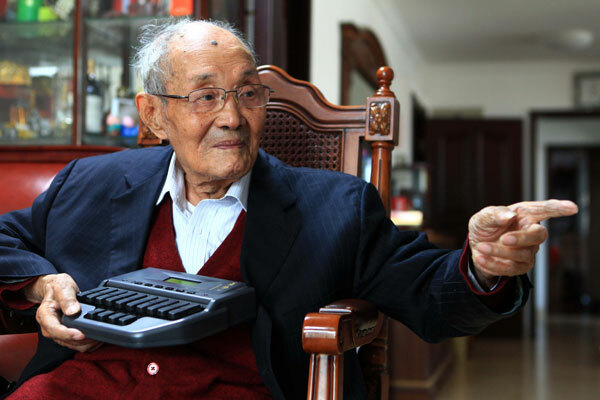 Then in 1994, at the age of 79, he invented the Yawei Chinese steno machine, allowing stenos to record up to 200 words per minute - about 75 percent faster than shorthand while eliminating the need to transcribe notes. Now, at the age of 95, Tang still pays close attention to the development of the industry in China. "Stenographers are recorders of history," said Tang, adding that shorthand is still the main method of recording in situations such as diplomatic meetings and trials. "But a lack of high-level talent is a big problem at the moment," Tang says. Most Chinese stenographers are technical school students or junior college students. "Accurate recording also requires stenos to have a good understanding of the subject they are recording, such as law, art, science and technology," he said. "That means they'd better get trained in college." However, only a few universities provide such courses. Tang said when he invented Yawei shorthand in the 1930s, he hoped "stenography would someday become a booming industry in China". Nearly 80 years later, Tang said he shares the same dream because "stenography still plays a key role in recording history". Tang's interest started almost by accident in 1930 when he came across a copy of Gregg Shorthand in a secondhand bookstore. The book explained a system for using English shorthand that was gaining popularity in the United States in the early 20th century. Realizing how useful the subject could be, he began reading related books in Chinese. In the following years while studying in a church school and serving as the secretary of the headmaster, Tang developed the popular Yawei shorthand method. After the War of Resistance Against Japanese Aggression broke out in 1937, Tang escaped to Chongqing in Southwest China. With financial support from his mother and friends, Tang published Standard Yawei Chinese Shorthand and founded the Yawei Steno School. Some of his students played vital roles in the war, with one spying for the Communist Party of China and gathering a lot of important military intelligence, Tang recalled. Later, Tang encountered the patriotic warlord Feng Yuxiang, who supported his work and became board chairman of the school. When the war ended in 1945, Tang followed Feng to Shanghai the next year and moved the school there. Tang started to explore the possibility of a shorthand machine during the "cultural revolution" (1966-1976). "Pen stenography is very convenient since one can take notes as long as one has a pen and paper," he said. "But it's very tedious to translate these symbols into words. For example, it may take six hours to translate a one-hour steno note." He invented a set of symbols based on the keyboard of an English typewriter, but it was complicated and impractical. The breakthrough occurred in the 1990s when computers entered the Chinese market. Inspired by piano performances, Tang decided to design a keyboard that allows stenographers to press keys with both hands at the same time, one for initial consonants and another for compound vowels. "It really saves a lot of time compared with traditional typing," Tang said. After numerous experiments and failures, in 1994 the Yawei Steno Machine made its debut at a national computer exhibition, attracting wide attention. Two years later, courts in the country followed one another in using the machine in court reports. "This was the beginning of a new shorthand era," Tang said. With the passage of time, Tang's passion for shorthand has never stopped. He even asked his son Tang Kewei, who has established a company to promote his father's ideas and steno machine, to follow in his footsteps.